Ahead of New York State’s primaries, we updated our analysis showing the religious profile of New York City’s five boroughs with new data from the 2015 American Values Atlas. New York City residents are more likely than Americans overall to identify as Catholic (30 percent vs. 21 percent, respectively) and much less likely to identify as white evangelical (1 percent vs. 17 percent, respectively) or white mainline Protestant (2 percent vs. 13 percent, respectively). 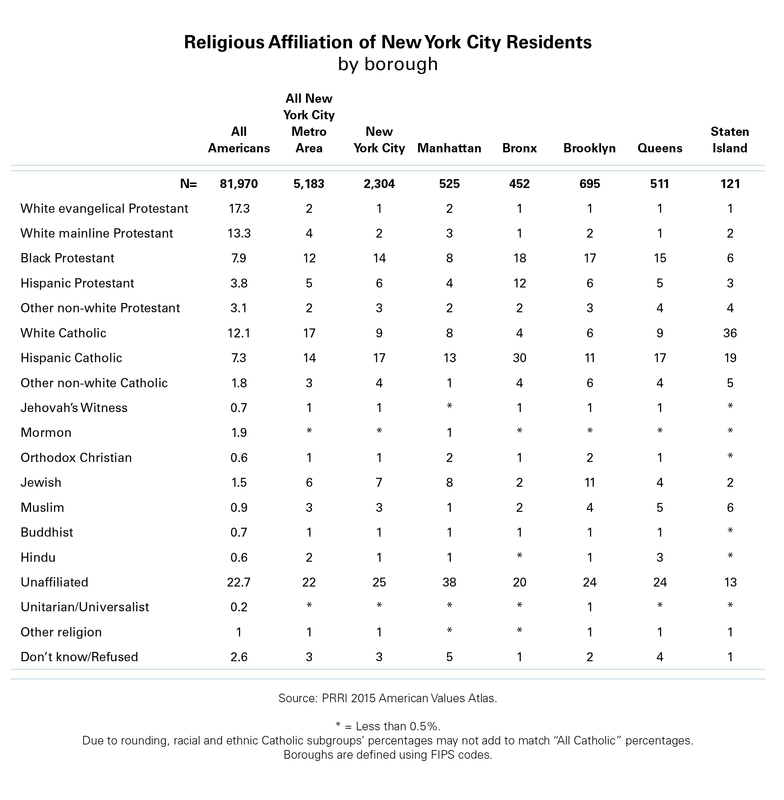 One-quarter (25 percent) of New York City’s residents are religiously unaffiliated, while roughly one in three residents identify as black Protestant (14 percent) or Hispanic Catholic (17 percent). Jewish Americans make up seven percent of the city’s population. Manhattan residents are the least religious of the five. Nearly four in ten (38 percent) residents of Manhattan are religiously unaffiliated, while only 13 percent of Staten Island’s residents identify the same. Jewish Americans comprise 11 percent of residents in Brooklyn but only two percent of Bronx residents. Three in ten (30 percent) Bronx residents are Hispanic Catholic. There are at least four times more white Catholics living in Staten Island than any other borough. Queens has the distinction of most closely resembling the religious identity of New York City overall.